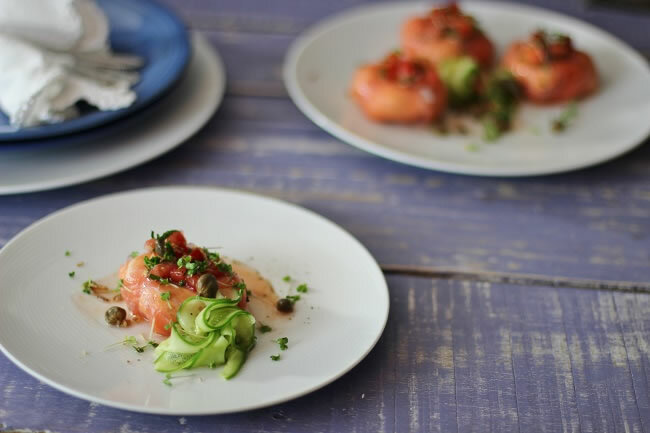 These Smoked Salmon Yoghurt Bombs or Smoked salmon parcels filled with delicious herbs, capers and creamy yoghurt make the perfect starter that can be prepared ahead. Smoked Salmon Yoghurt Bombs sound so intriguing don’t they?. As well as being intriguing they are a very handy make ahead dish for parties or dinners. 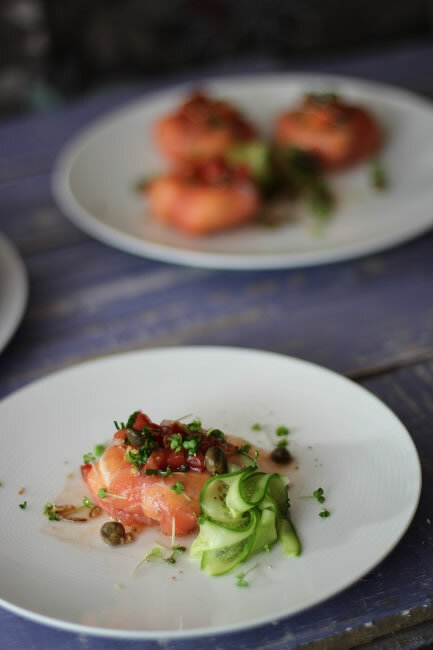 I love smoked salmon, it pairs with so many big bold flavours. I eat it just the way it is or I sometimes cook it, like I did here. 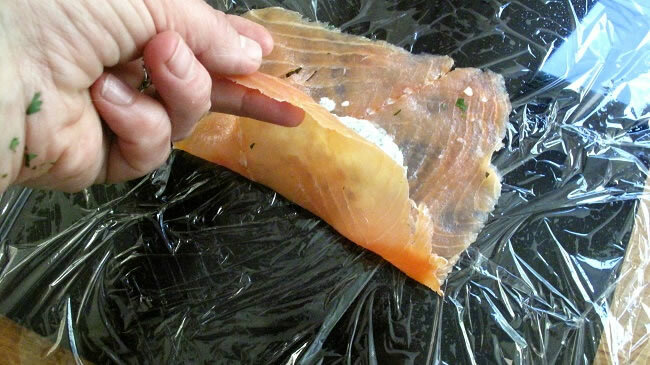 Smoked Salmon or Trout can be hot or cold smoked. So what’s the difference? 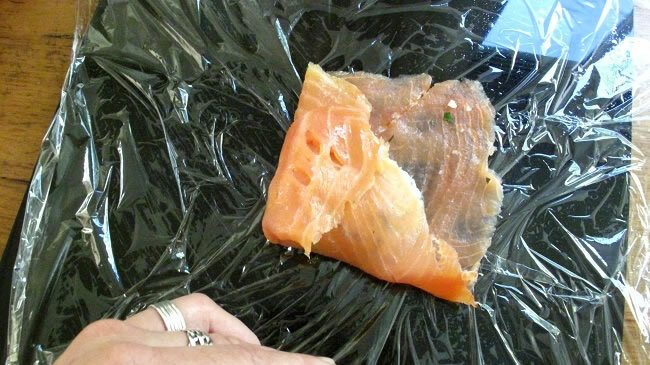 The quality of the fish is the most important factor when producing cold Smoked Salmon because the fish isn’t “cooked”. 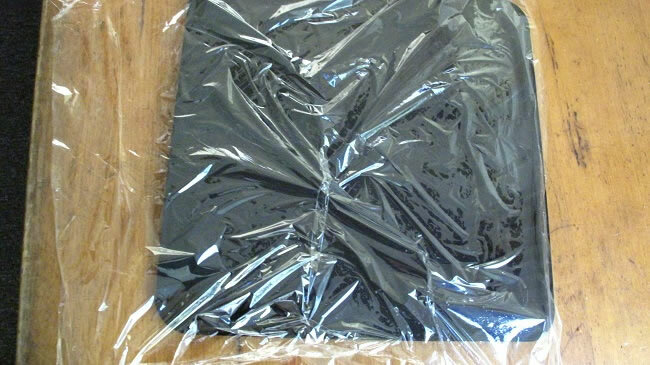 The process is more about preserving the delicate texture. The fillets are brined or salted before being smoked away from any heat source. The smoke is only applied at low temperatures typically at 37 °C (99 °F). This is around about our blood temperature and flavour is imparted without the flesh being changed . As a general rule most smoke houses do not produce an overly “smoky” fish. 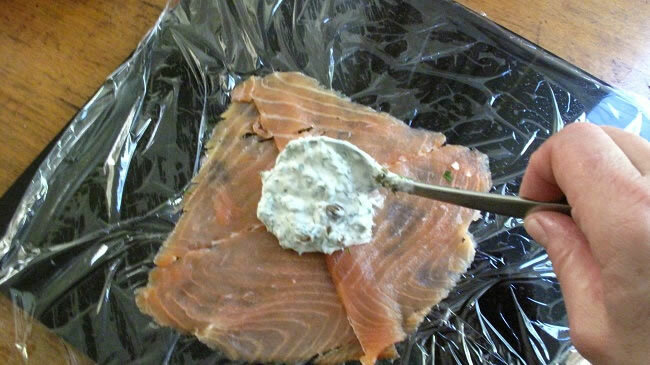 This very low smoke taste method was first practised in the smoke houses of London and in Scotland and it is a generally preferred, because it allows the natural flavour of the fish to dominate. In other parts of the world especially Alaska and Canada, more smoke and a sweeter fish is preferred. Sugar is added during brining. During Hot Smoking the fish are either put into a brining solution with salt water, spices and herbs or covered in a dry brine of salt herbs and flavourings and in some cases sugar. The fish are then smoked at a high enough temperature to cook the flesh. This will often result in a much smokier fish. 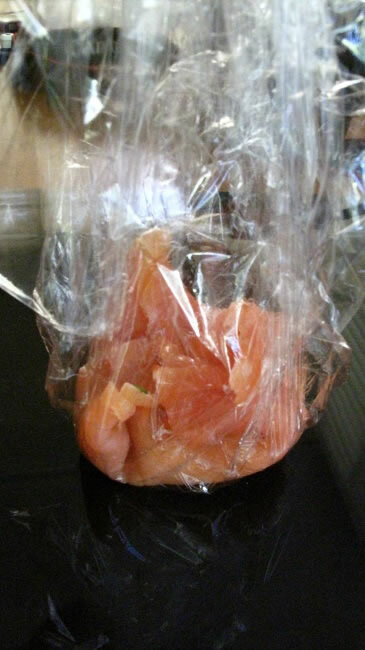 I love hot Smoked Salmon or Trout in salads and pastas . 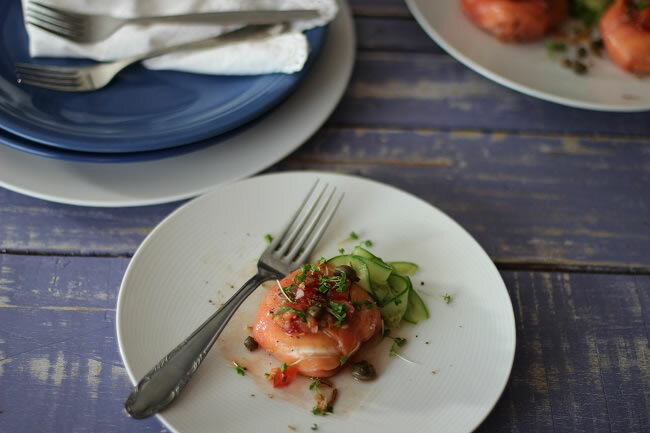 This completely gluten free treat goes amazingly well with quick pickled cucumber and a tomato caper salsa. This how it’s done . 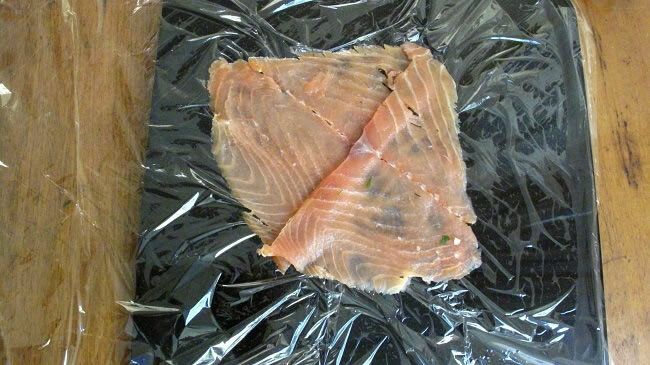 Lay out two slices of smoked salmon or trout on a square of cling wrap, approximately 20cm x 20 cm, (8 inx 8in) .Overlap the slices after cutting off the brown membrane running at the top of each slice. 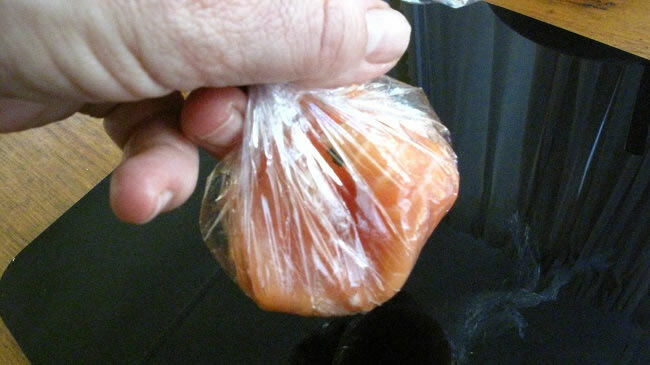 Put a tablespoon of the yoghurt onto each 2 slice package and pull up the plastic bringing all of the sides together. 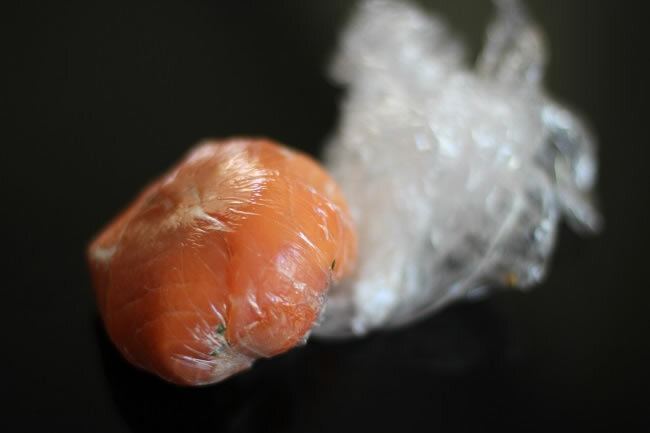 Secure with the top of the cling wrap by twisting to seal together in a round bomb shape. As you finish each one pop it in the fridge to cool and set. Put the chopped tomato and it's juice into a bowl and add the rinsed chopped capers. The rinsed Spanish onion ( the onion should not be overpowering, use chives if you like), then the parsley lemon juice and olive oil. Mix well and taste for seasoning. Stand. Put the sugar and vinegar into a saucepan and simmer till the sugar is dissolved. Add the small amount of wasabi and stand till cooled. The wasabi adds a lovely flavour and is not hot and spicy. 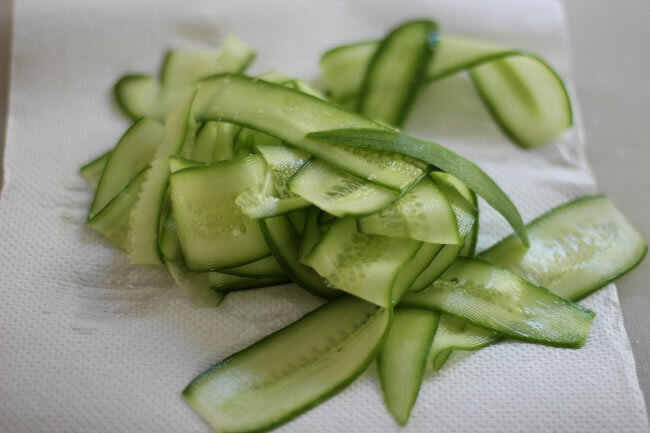 Pour this mixture over the cucumber ribbons and refridgerate for up to around 3 hours. You can make the syrup ahead and add the cucumbers a little bit before you need them. They go very transparent and soft after this time. They are still lovely but they don't have the same crunch. 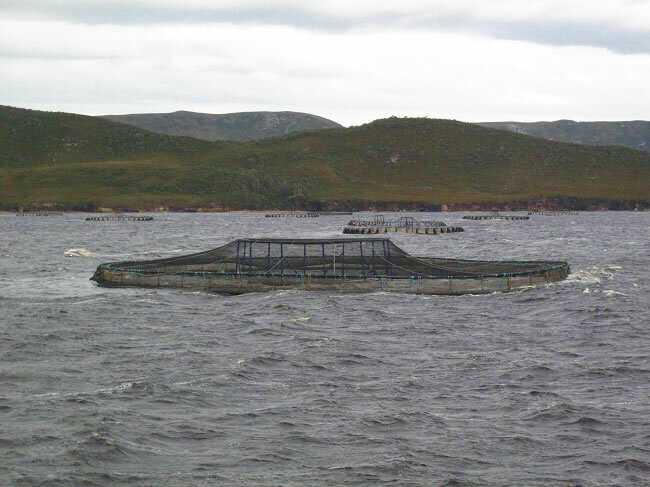 This is where most of our Smoked Salmon comes from in Australia. 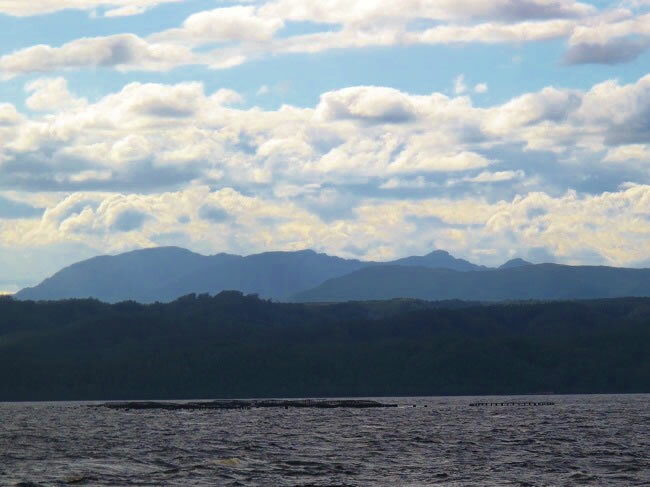 These were taken when I was in Strahan on the west coast of Tasmania. The Salmon and Trout swim around in those cages. Surprisingly the predators are not only birds but also Seals, who take the opportunity to have a private dining experience if they can breach the sides. I too love smoked salmon and trout too. Your gorgeous photos and description made my mouth water. This is definitely a recipe I need to try and soon. Thanks for sharing those facts too — I had no idea. I love the yogurt inside! Great idea! This is beyond delicious! Can’t wait to try it! I love the addition of yoghurt here Tania! I often find the taste of creme cheese quite rich so this is definitely something I’d love to try. 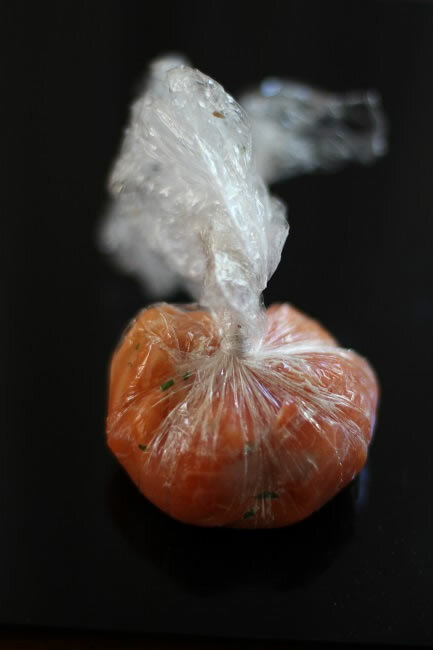 I, too, ama a smoked salmon lover and use it to make a favorite pasta. Your “bombs” look so very good and plating one with the pickled cucumber makes for one very nice presentation. That was a great tutorial on how to make those little bombs – very pretty. 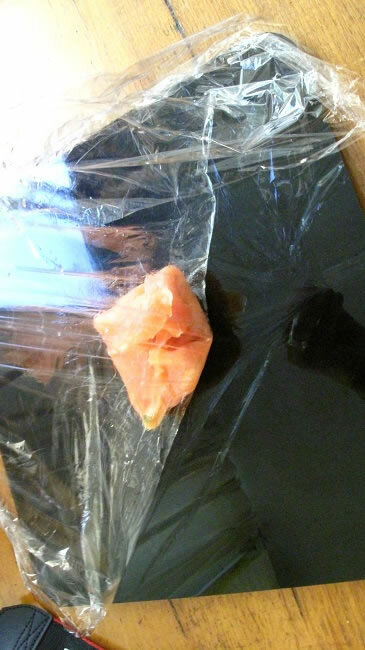 Thanks for the run down on how the smoked salmon is prepared. Can you also get wild salmon in Australia? Leave it to you to come up with a bomb. They sound really good, Tania! Lovely dish darling, and I was really interested to read about the difference between hot and cold smoking. I’m torn over the issue of farmed salmon because of the environmental impact, but wild caught stuff tends to have so many other issues with bugs and pollution.. These look and fantastic. I love yogurt and smoked salmon. 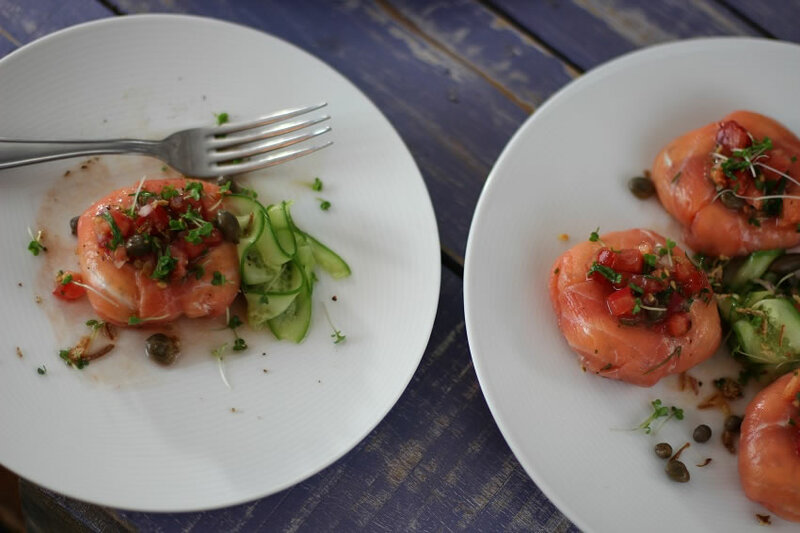 I will have to give these a go when my hubby comes home, he loooooves smoked salmon too – I just don’t buy it enough. 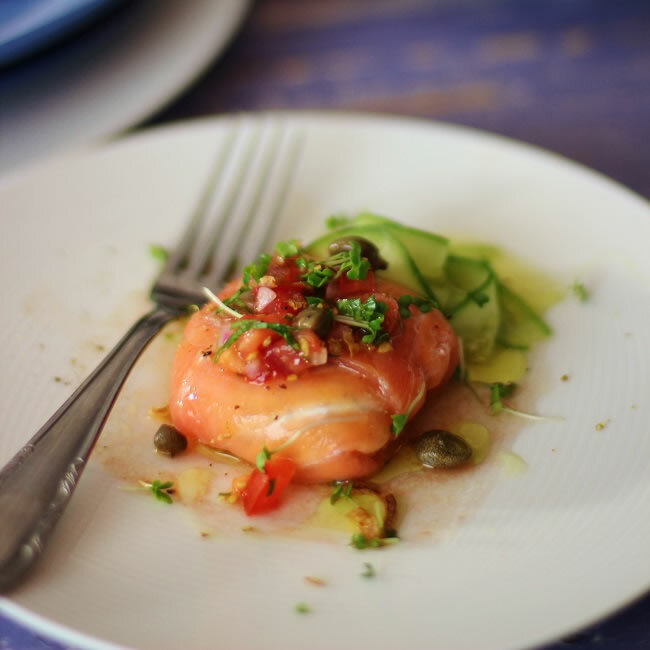 Love the recipe, and I might just request this for my Mothers Day brunch- yummo! 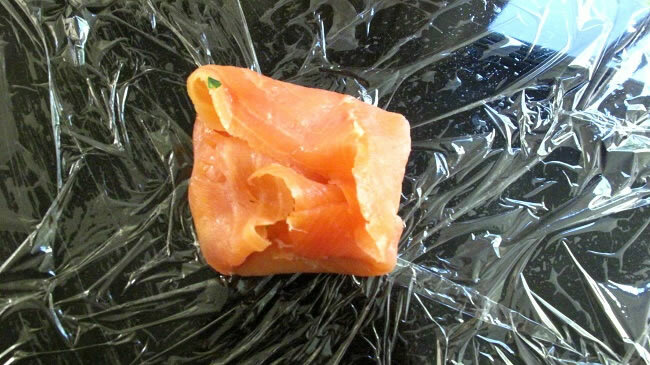 what a fancy smoked salmon parcell! 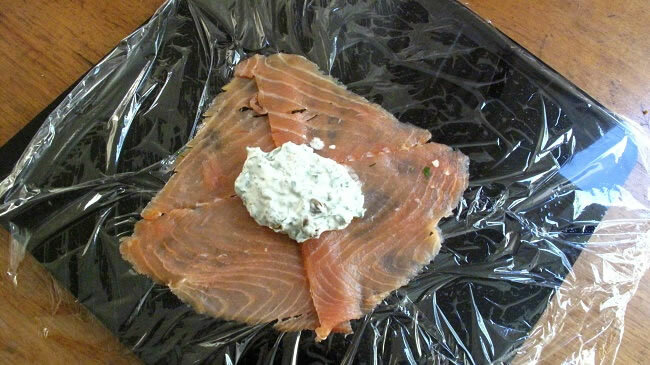 Ohhhh… I bought some smoked salmon yesterday thinking I could make some dip but this looks even better! !